Cause of her death was Cancer of the breast. Another name for Eliza was Elizabeth Matilda McBurney. Lived on the Hugh McBurney Sr. farm, later the original McBurney homes tead. Eliza died by heart attack and cancer and was seriously ill fo r only a few days. Tom was ill with throat cancer for about two week s before dying. 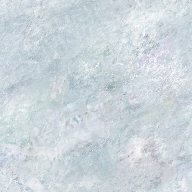 Event Description: Tiffin Cemetery, Concession 4, Lots 28 & 29, Kinloss Twp., Bruce Co.
• 1881 Census of Canada: Matilda, age 7, with father Richard, age 42, mother Priscilla, age 31, 4 Apr 1881. 59 , and siblings William, age 11, Robert, age 9, John, age 5, Richard, a ge 4, and Mary, age 2. Eliza Matilda, age 7, with father Richard, age 42, mother Priscilla, a ge 31, and siblings William, age 11, Robert, age 9, John Albert, age 5 , Richard James, age 4, and Mary Jane, age 2. • 1891 Census of Canada: Eliza, age 17, with father Richard, age 52, mothere Priscilla, age 40, 18 May 1891. 60 , and siblings William, age 20, Robert, age 19, John, age 15, Richard , age 13, Mary, age 11, Annie, age 9, Adeline, age 7, Arthur, age 4, a nd Herbert, age 2. Eliza, age 17, with father Richard, age 52, mother Priscilla, age 40 , and siblings William, age 20, Robert, age 19, John, age 15, Richard , age 13, Mary, age 11, Annie, age 9, Adeline, age 7, Arthur, age 4, a nd Herbert, age 2. • 1901 Census of Canada: Eliza, age 27, with husband Thomas, age 32, and children Mary, age 7, 1901. 107 , Vera, age 5, John, age 3, and Ida, age 1, with domestic Emma Ferguso n, age 21, and Thomas's brother Harry, age 23. Eliza, age 27, with husband Thomas, age 32, and children Mary, age 7 , Vera, age 5, John, age 3, and Ida, age 1, with domestic Emma Ferguso n, age 21, and Thomas's brother Harry, age 23. • 1911 Census of Canada: Eliza, age 37, with husband Thomas, age 43, and children Vera, age 15, 1911. 108 , John, age 12, and Ida, age 10. 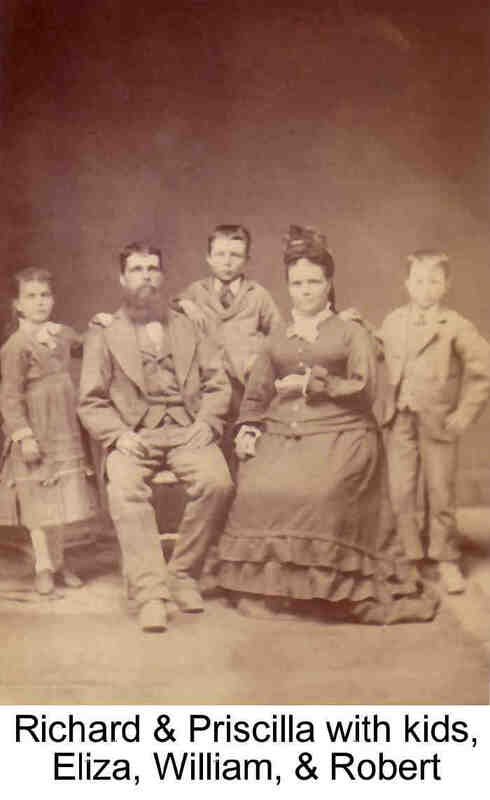 Eliza, age 37, with husband Thomas, age 43, and children Vera, age 15 , John, age 12, and Ida, age 10. • 1921 Census of Canada: Eliza, age 47, with husband Thomas, age 52, and children Vera Mable, a, Jun 1921. 109 ge 25, John Richard, age 23, and Ida Adeline, age 20. Eliza, age 47, with husband Thomas, age 52, and children Vera Mable, a ge 25, John Richard, age 23, and Ida Adeline, age 20. 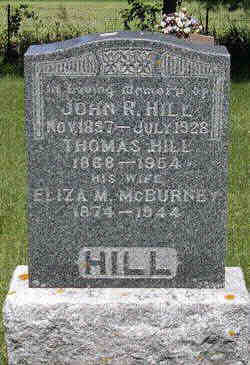 Eliza married Thomas Hill, son of John Hill and Mehilah Humphries, on 20 Feb 1893 in Kinloss, Bruce, Ontario, Canada 2,54,98,103.,104 (Thomas Hill was born on 18 Aug 1868 in Hullett, Huron, Ontario, Canada,2,54,98,110 died in Oct 1954 2,54 and was buried in Teeswater, Bruce, Ontario, Canada.). The cause of his death was Throat Cancer.